Canopic jars played an important role in the rituals of ancient Egyptians of which the most prominent was the mummification process. They were wide necked containers in which the internal organs of the deceased were stored before mummifying the dead. Egyptians believed in an afterlife and stored the internal soft organs like the stomach, intestines, liver, and lungs. These organs constituted the ‘viscera’. Each organ was stored in a separate Canopic jar. It is interesting to note that heart was left inside the body because the Egyptians believed that heart was the soul and it was weighed afterlife to see whether the person leads a good life. 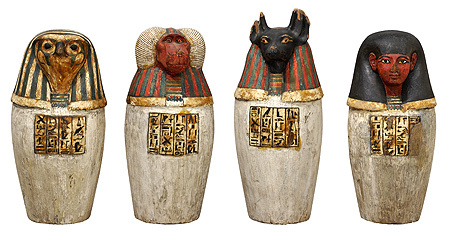 Canopic jars were made of a wide range of materials like pottery, gold, bronze, precious stone, wood, calcite etc. The nature of the material depended on the wealth of the owner. The size of the canopic jars varied from 5 inches to 10 inches in size. The style and shape of Canopic jars changed with time. Initially, there were plainly decorated ones and later beautifully designed ones. The origin of the term ‘canopic’ is widely debated. There was an ancient Egyptian port called Canopus, east of Alexandria, whose inhabitants worshipped Osiris, the Egyptian god of the dead. Most believe that the name ‘canopic’ derives from this source. The jars had lids that were shaped as the head of one of the minor funerary deities known as the Four Sons of Horus. The jar which contained the stomach was protected by goddess Neith and had Duamutef as the patron. Qebehsenuef was the patron of the jar containing intestines which were protected by goddess Selket. Goddess Isis protected the jar which contained the liver which was patronized by Imseti. Hapi, the god whose jar contained the lungs was protected by the goddess Nephthys. The names of the protective deities were often written on the jars, along with a magic formula to invoke the powers of the gods. Sometimes, the lids of the jars would be shaped as their heads: Imsety’s head was that of a human, Hapi’s that of a baboon, Duamutef’s that of a dog and Qebehsenuf’s that of a falcon. The organs were individually wrapped in linen. The linen package was put into canopic jars and consecrated oil was poured over them. Thereafter, the jars were closed and conserved. The jars were placed inside a canopic chests or boxes. The simple canopic chests with flat or vaulted lids began to imitate shrines. The jars were normally buried together but kept separate from the mummified body. 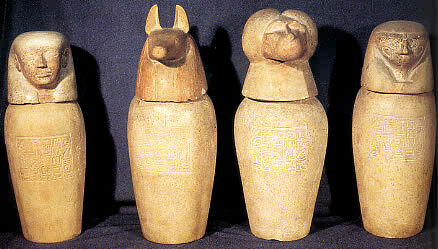 In the pyramids built during the Old Kingdom, the canopic jars were often placed in a shallow pit near the sarcophagus. This pit was then covered with a slab.